Federal University, Ndufu-Alike, Ikwo, FUNAI Post-UTME screening form for 2017/2018 academic session is out. The FUNAI Post-UTME registration/application for 2017/2018 admission exercise has now commenced. The 2017/2018 FUNAI Cut-off Mark for Post-UTME candidates is 180. The 2017/2018 Post UTME Screening Exercise of the Federal University Ndufu-Alike Ikwo still holds as scheduled, starting from Monday, 18th September, 2017. Candidates are advised to print their registration slips from the portal to know the date and time of their examinations. Candidates should note that cellphones, bags, books etc shall not be allowed in the examination areas. Candidates are to come with their original JAMB Slips, registration slips and biro only. Please, be properly guided. Return to the FUNAI Post-UTME Application page and enter your “JAMB Registration Number”again. And come with it for the FUNAI Post-UTME Test. 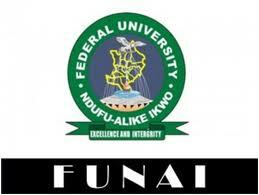 TEST REQUIREMENTS: DOCUMENTS TO TAKE ALONG TO FUNAI POST-UTME SCREENING!